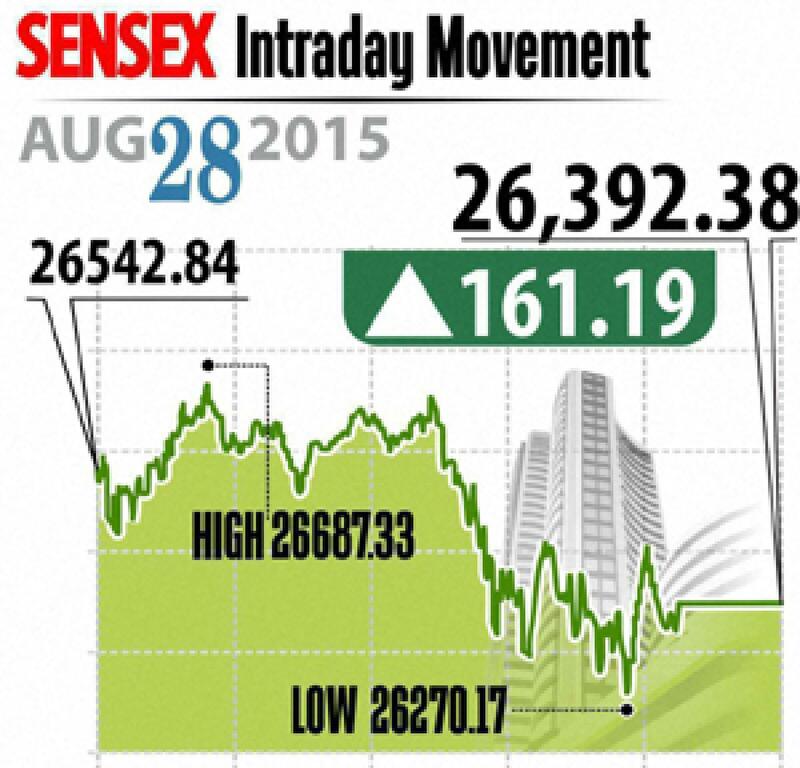 Markets upbeat over global cues. The markets gain on Friday with the encouraging global cues like buoyed US data, fresh stimulus plan by China and dimming chances for the Fed rate hike in September. Mumbai: The markets gain on Friday with the encouraging global cues like buoyed US data, fresh stimulus plan by China and dimming chances for the Fed rate hike in September. Despite volatility, the equity benchmarks have managed to close higher with indices rallied over 1.5 per cent, however, the profit booking at the last two hours brushed off the gains. Sensex up by 161 points to close at 26,687 and Nifty gained 53 point ended at 8,001. However, the broader markets underperformed benchmarks, to close flat. On sectroal front, the sectors oil, IT and metal indices rallied gaining around 1 per cent each, while the bank and pharma closed in red. From oil space, ONGC zoomed over 5 per cent, others include Cairn, Oil India and GAIL up 2 to 4 per cent each, however, RIL ended flat. The IT stocks also gained with Infosys and Wipro up over 2 per cent each. The prices of copper and Zinc led the rally in metal stocks with Vendanta up 5.7 per cent, Hindalco up 1.4 per cent and Tata Steel up 1 per cent. On the other hand, Sun Pharma lost 2 per cent as the company is facing class action suit in US courts over 2009 plant closures. The gainers: Vedanta, up 5.70 per cent at Rs 96.35; ONGC, up 5.55 per cent at Rs 243.55; Bharti Airtel, up 4.29 per cent at Rs 362.25; Bajaj Auto, up 3.65 per cent at Rs 2,269.20; and Gail, up 3.17 per cent at Rs 289.80. The losers: Sun Pharma, down 2 per cent at Rs 884.95; Lupin, down 1.89 per cent at Rs 1,862.70; Coal India, down 1 per cent at Rs 357.40; TCS, down 0.27 per cent at Rs 2,570.65; and L&T, down 0.24 per cent at Rs 1,616.90.